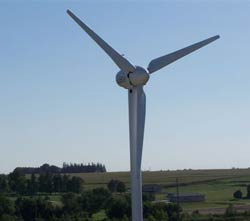 A 20kW wind turbine produces enough energy to power several US homes. 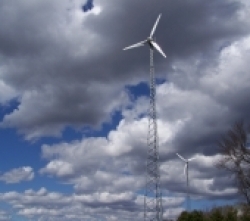 These are residential turbines but are also used as community-sized wind turbine that produces the right amount of power for residential development, farms, and small businesses. Predominantly, however, 20kW units are often used in agricultural and light industrial applications. It has also been used for years in remote village applications, where diesel power systems supply electricity for a small grid. A 39.9kW wind turbine produces enough energy to power a small US neighborhood. These devices are also intended for agricultural and light industrial applications. It has also been used for years in remote village applications, where diesel power systems supply electricity for a small grid. A 50kW wind turbine produces enough energy to power a small US neighborhood. These devices are also intended for agricultural and light industrial applications. It has also been used for years in remote village applications, where diesel power systems supply electricity for a small grid. 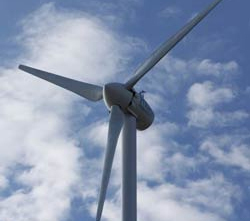 A 100kW wind turbine produces enough energy to power 15+ homes. 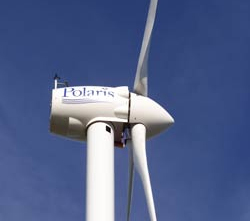 These are not residential turbines but are community-sized wind turbine that produce the right amount of power for school and university campuses, residential developments, farms, municipalities, and a variety of businesses ranging from injection molding factories to extrusion houses. They can also be used in small wind farms for direct grid hookup.